After shuttering Microsoft Outlook for Custom Domain there only a few options remaining for free email hosting. One of the most reliable option is Zoho Mail. This service is provided by Zoho and already been featured on various top blogs and news sites. However, Zoho do not provide as much as features as Outlook and Google Apps provided but it has some unique features also which can’t be expected in a free email hosting solution for personal and small business. One of the key feature is Ad free interface. The storage for free accounts are just 5GB/user but they do provide POP3/IMAP support. So if the space is not enough for you then you may send and receive emails from other services like GMail, Outlook or Yahoo mail. Initially, free signups comes with 5 free accounts (if you have a domain). Which can be further increased to 20 by inviting 3 business signups. With each successful invites 5 accounts will be added for lifetime. Previously, Microsoft Outlook for custom domain was top in providing free email hosting since November 2005. But Microsoft shutter the service to promote Office365, which is a paid service. I had wrote about setting up Outlook Custom Domain but since the free option is no longer available people started asking me about hidden tricks to get it for free. Frankly, this is not possible to signup for free email hosting at Outlook for new domains. Not only this but if you already have active service then soon you will not be able to add more users to those domains. Since the two biggest players, including Google Apps for free and Microsoft custom domain, ended the free email hosting for domains. So, what are the options? I have discussed this in my previous post. The only most reliable service, as available now, is Zoho Mail. 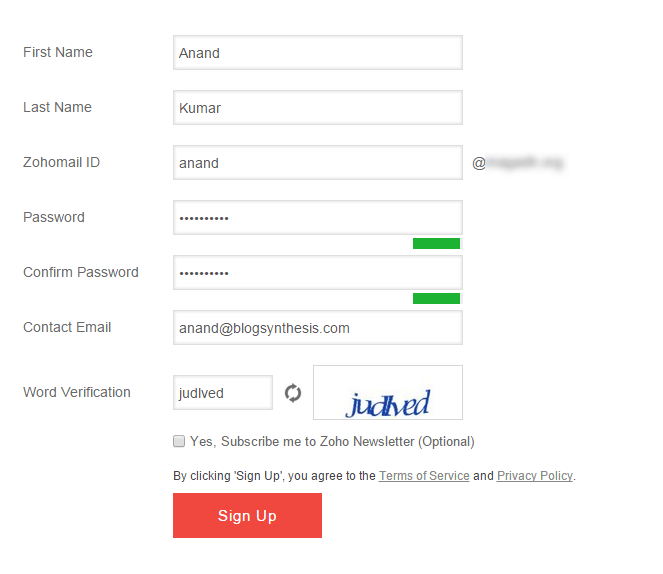 And in this post I will share how to setup Zoho mail for free email hosting. 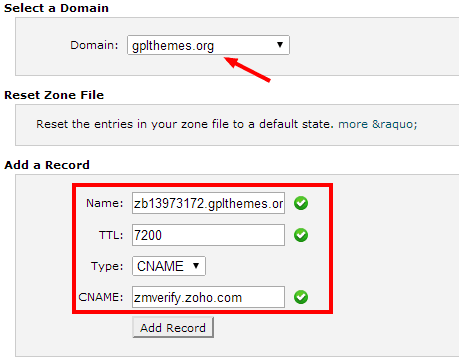 It’s really easy to setup up for free Zoho mail for your domain. You can do this by yourself. For any clarification or help ping me in forums or on social media. 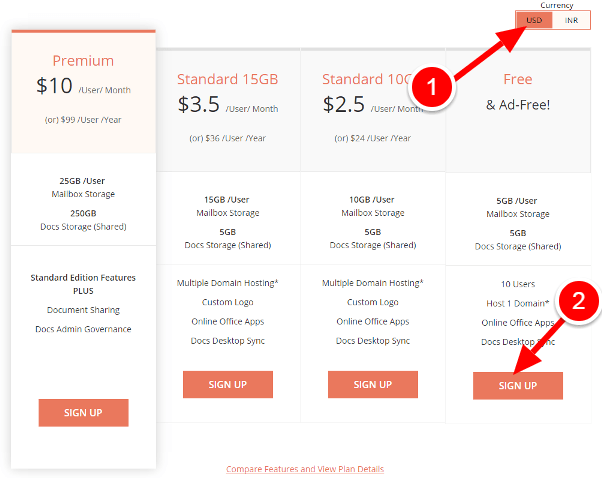 Visit ZohoMail Pricing page and choose “Free” option. You may also choose your preferred currency. [At Zoho Free plan is also called “Lite Plan”.] Hit the “Signup” button to get started. Note: You would not be able to add more domains to your free account. On the next page you will have to create your first account and verify your existing contact email address. This contact email is required to activate your account and reset your admin password, in case you forget in future. Check the image below. This will be another simple form asking for name, email, username for your custom domain, and password for that. Once you satisfy click on signup. On the next page you will be asked verify your domain. Also an email will reach to your email address. Verify the email id by clicking the unique link. Meantime, do not close the signup previous “congratulation” page. Go to your email account and verify your email account. Now click the “Proceed to verify domain ownership” link. If you can’t to see this page, go to mail.zoho.com and hit “Access Mail” a red button on the top-right of the page. on the next page there will be a link. Choose CNAME method to verify your domain ownership. On this page, you will also have DNS provider specific guide. You may select the option using dropdown. At the time of writing this tutorial Godaddy, 1 and 1, Enom, Euro DNS, WordPress, cPanel, Bluehost, Open SRS – Squarespace, Network Solutions, Name.com and Register.com were in the list. Here comes the tough part (not really :P). If you have done this before then you will easily configure it. Else, proceed with caution. There are three ways to verify your domain. The first two options will take time. It may takes a few hours ( but sometimes take up to 48hrs or sometimes more). The third option will be instant. But you will probably need a web hosting and know how to upload the file to the root directory of the domain. Depending on your condition choose an option. Don’t forget there is a small dropdown for help. If your DNS provider is listed there then you may check the help article, in case you need. If you stuck at any point or unable to configure Zoho mail. Join our forum and start a fresh topic. I will help you to configure. If you are out of time or these things complex then you may hire me to do all these things. However, I will choose the first method to show you how to do that. The domain I added is hosted on HostGator and the DNS (hostgator provides) is also managed from the cPanel. Now add the CNAME. Now we will have to wait for a few hours. After sometime, go to the same page (zoho domain verification) and hit “Verify” button. Once, the account is verified you will see a message saying “You have successfully verified ownership of gplthemes.org. Enter a username below to create your administrator email account:” Your first account will be prefilled. Simply check for any typo and proceed to setup MX records. Zoho mail MX records. You will need to add these records to your domain. 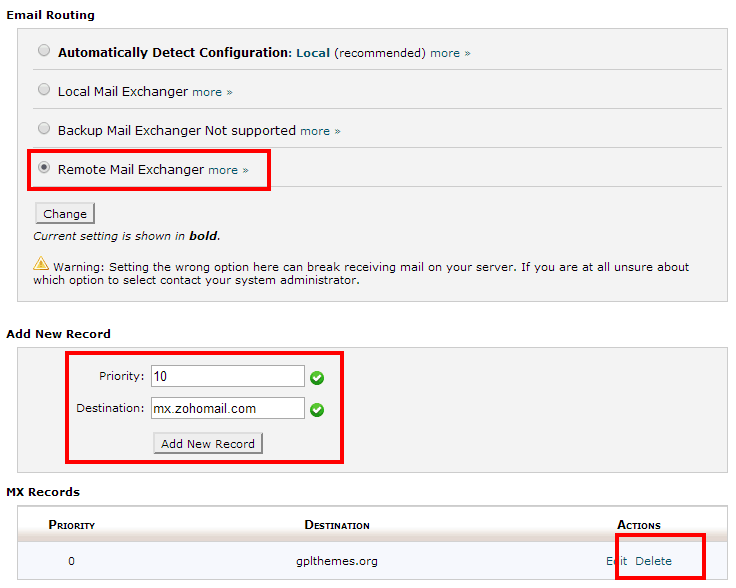 Again if you are using cPanel then find and click “MX Entry” under “Mail” section as shown below. 1. Now add the 2 MX records one by one. 3. Make sure to delete any default entry if there is any. Now you have completed the setup for Email Hosting. Remember, like CNAME we added earlier, it will take up to 48 hrs. (or sometimes more) to work. If you want to receive emails in your Outlook, Gmail, Yahoo or Mobile devices then the following details you will need. For any Configuration related problem visit forums. I was planning to start using Zoho for my new domains, thanks for providing a wonderful guide. No *invitation* required. Simply visit https://www.zoho.com/mail/zohomail-pricing.html and signup for the service. Thanks so much for sharing Zoho. I was disappointed to read Outlook no longer is providing free domain e-mail but this lead me to Zoho which offers just as much as Outlook and they look more suited to businesses and that’s what I need. Thanks again for your wonderful guide! Thanks for the great and detailed article. I’m using free Google apps for my domain as of now but I need one for my client so decided to go with Zoho. Thanks for the article., Great news is that zoho has increased the free mail accounts (for ONE domain) from 5 to 10.. Hurray!! I have been using zoho and a seamless syncing across all my idevices and so far so good! Can email IDs created on ZOHO be opened in Gmail or it will have its own webmail interface? Though theyhave POP/IMAP but I donot think they will be providng option to open emails with Gmail (with linking it with another primary gmail ID).. If anyone is familiar with the process of doin it, let me know..
You can set up zohomail and then forward it to your gmail account if you’d like to use gmail’s webmail. you can also set up g+ with your domain name. But outgoing emails written from gmail will be sent from your gmail address, not the zoho domain. I have 26 domains with Google Apps Standard – Free edition (10/ 25/ 50/ 100/ 200/ 500/ 1000 / 2000 User A/C) for sale. All domains are 5-6 characters .COM registered with Godaddy. I had just bought a domain from namecheap.or for $0.98 and thought I was doing well then I saw MS had stopped the custom domain service … and I was panicking! I tried to send smtp via namecheap, but I couldn’t without a “paid” hosting or email product. I almost bought an email product, when I found your blog and the Zoho suggestion. I checked out Zoho and they had a great reputation. So I tried it and all is working great. Good to know the post helped you and thanks for your meaningful comments. This is SO much better than the instructions provided by Zoho or the hosting companies. This guide finally ended my frustration. Thank you!!! I’m already using outlook for my domains email, but I need to create new ones. Do u know if it’s possible to still use the existing outlook account that I have and create the new ones with Zoho, or do they all have to be provided from the same service? How many mails we can send in a day through this account? also what about monthly limit? Is there any restrictions like emails per hour limit? I see that this post is a few months old. I am having difficulty finding any details about the success of ZoHo. Has anything changed since this post was written? By the way, great instructions, Anand, very easy to follow. Thanks for reporting, Marty. I will take a look and update the post acordingly. Does Zoho work with Mail App for iOS? i would like to switch from hosting account to this free service but wondering if I can still use Mail app. And will I lose all my emails when i point to new cname? Thanks! Thank you so much for your valuable time and efforts to put in a great and helpful article. Appreciate that. Thanks for the info. I am glad to say that I have set up and been using zoho mail for a few months now :). Anyone interested to sign up for zoho email hosting AND get 5 bonus users which brings the total to 15 instead of 10 mailboxes? There’s an on-going promo which allows both the sender and recipient of zoho mail invitation to receive 5 extra mailboxes. Pls reply the thread here if interested, thanks!